Best-selling author Anthony DeStefano wrote his best book at age 15, as a student in a creative writing class taught by Pulitzer Prize winner Frank McCourt. Not everyone would agree with the self-effacing writer. DeStefano is the author of the adult best-sellers A Travel Guide to Heaven, and Ten Prayers God Always Says Yes To. This Little Prayer of Mine, a children’s book, was published earlier this year. But Little Star was his first book, written as an assignment for Angela’s Ashes author McCourt when DeStefano was a student at Stuyvesant High School in Manhattan. Little Star is a beautifully illustrated retelling of the Nativity story and a star, until then all but unnoticed in the night sky, who burns himself out to keep the newborn baby Jesus warm in a Bethlehem stable. DeStefano’s book was initially turned down by publishers, but many of them tempered their rejections with letters of encouragement. In 1981, famed actress Helen Hayes did a public reading of the book during an Easter Seals event in Manhattan. DeStefano still has the original manuscript in his office in New York City. 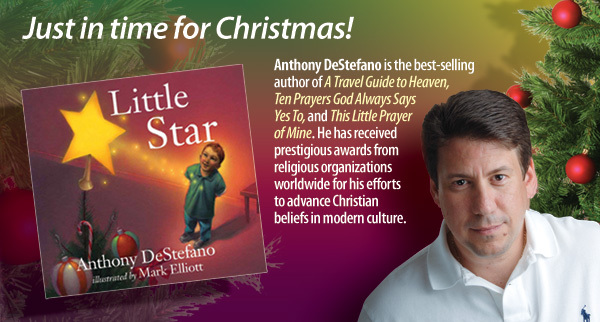 The new version, illustrated by Mark Elliott, the artist who worked with DeStefano on This Little Prayer of Mine, was just published by WaterBrook Press in anticipation of the Christmas season. The author hopes audiences of all ages will respond to the story of sacrificial love and its message that everyone—even the tiniest and poorest and least significant among us—matters. “My goal was to try to encapsulate the whole gospel message in a simple Christmas story,” said DeStefano. And his grade in that long-ago creative writing class? Frank McCourt gave him an A.